Hi everyone! Today I am back with a tutorial that goes along with one of my most popular post, the paper flower backdrop. 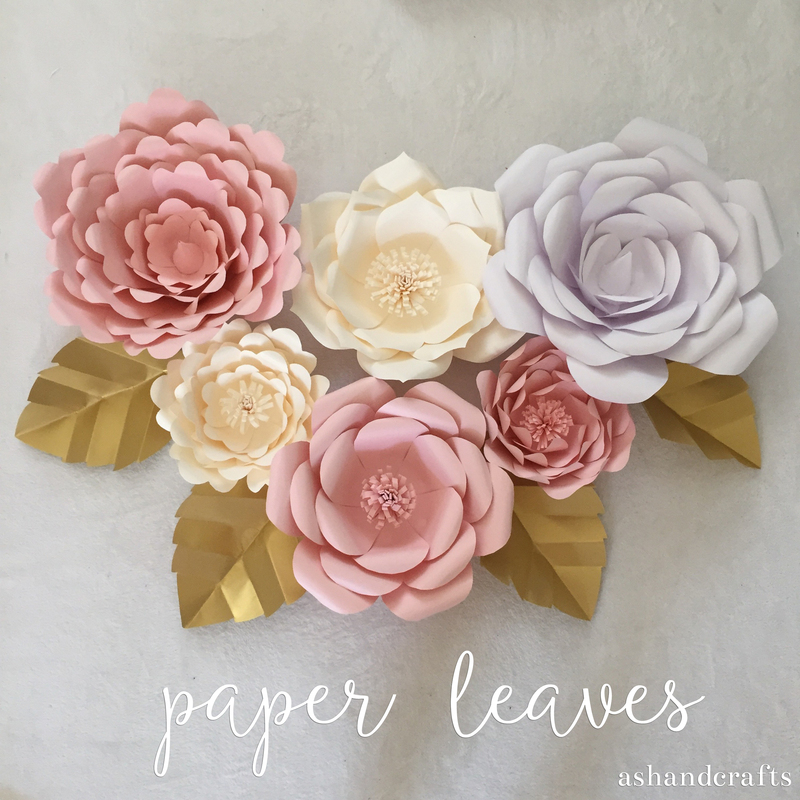 This tutorial will be on how to create the paper leaves that go with the flowers. For this tutorial, you’ll need the template, paper, scissors, and a pencil. I hope you liked this tutorial! I’ll be posting more flower templates soon! Subscribe to my email list to be notified when there is a new post! Hi, where did you buy your gold paper at? Hi, Ashley ~ These flowers are gorgeous, and I love the leaves! I can’t wait to make some of these to tuck in my decor and add to my hand-stamped cards! Hi Ashley! These flowers are gorgeous. I can find the paper for template but i do not know what kind of the paper you used for the leaf, and where did you buy your gold paper? Thank you for sharing. Paper flowers are beautiful. How do you hang them on the wall (double face tape?). Or how do you hand them on a curtain? can you send the petal template for the middle white flower on top, please? These flowers are fabulous!! What kind of paper you used for the flowers or what you recommend? Hey love the leaves idea, thanx for posting. And the middle of flowers previous post. Great tutorials! I’m not sure if someone has asked this question before and I apologize if it’s repeated, how long does it take you to make about 20 giant flowers including the leaves as a background for pictures? This is so beautiful! Is this flower decoration for sale? I like your craft Art it’s a amazing! Thank you for sharing!! your website so beautiful design lovely ! Estoy muy sorprendida por el excelente trabajo que realizas. I loved it. Flowers are so beautiful. Saludos de Perú. what paper is it that you use? I would like the template for the flower. When O click the template it is for the leaves. Hello! Thank you for sharing this. Really beautiful ❤️ I wanna ask if do you have a templates for paper petals? Thanks! Hi which kind of cardstock did you use from papersource? Hi, I m making flower for my daughter law baby shower, it so easy and love the pastern. Thank you so much for all your imput and vidios it help me tremendously.